The third installment of the annual Volvo National Alumni Golf Cup once again sees guests and participants come together for a round of golf at Ayala Greenfield Golf and Leisure Club, Calamba, Laguna on July 3, 2017. 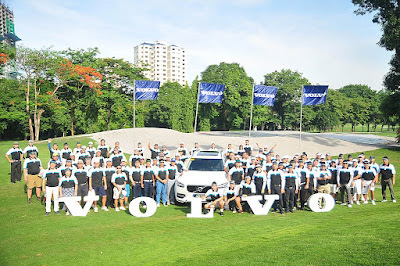 This yearly Volvo Philippines activity, started in 2015, is an exclusive, by-invitation only golfing event where graduates from top educational institutions here and abroad pit their skills on the fairways. Previous winners are alumni from the Philippine Military Academy (2015) and the College of St. Benilde (2016). Teams from previous years came from various schools such as Stanford University, Ateneo de Manila University, San Beda College, St. Luke’s College of Medicine, University of the Philippines, University of the East, De La Salle-College of St. Benilde, Asian Institute of Management, De La Salle University, Far Eastern University, Philippine Military Academy, University of Santo Tomas, and Philippine National Police Academy. The sprawling greens of the golf course will also see the recently introduced Volvo 90 Series – the new XC90 AWD SUV, the stately S90, and the versatile V90 Cross Country. The impressive triad of Volvos will certainly be a pleasing treat to Volvo enthusiasts present, as they can get up close and personal with these exceptional new models. Swathed in striking good looks and equipped with the latest innovative and intuitive technology, the 90 Series models is a combination of swift power, stirring design and clean efficiency. Globally, Volvo has been at the forefront of the golfing community for more than a quarter of a century. With golf and other active lifestyle activities serving as the perfect common ground, Volvo Philippines has enabled the building and strengthening of relationships between Volvo and its customers, enhancing the overall ownership experience.